The MDP is hoping to capitalize on the government’s apparent shaky grip on power with a prolonged mass protest on November 27. The opposition is hoping to capitalize on the government’s apparent shaky hold on power with a prolonged mass protest on November 27. 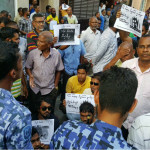 The protest aimed at pressuring President Abdulla Yameen to free former President Mohamed Nasheed and other political prisoners, is the Maldivian Democratic Party’s fourth mass protest this year. 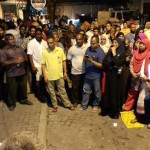 “The difference this time is that this is the first mass protest to be staged since the infighting exposed within Yameen’s government. 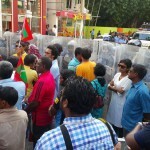 We plan to continue the protest for as long hours as possible,” said Imthiyaz Fahmy, the MDP spokesman. A minor blast on Yameen’s speedboat on September 28, which the government insists was caused by a bomb, led to the arrest and impeachment of the vice president, the sacking of the defence minister and police chief in a wide shakeup of the security forces, and acknowledgment of missing weapons and missing money from tourism leases, thought to run into tens of millions of dollars. The top brass of the police force was shuffled and at least six soldiers have been arrested over the boat blast. MDP’s protest, titled “For Emancipation,” was initially scheduled for November 6, but was called off after Yameen declared an unprecedented nationwide 30-day state of emergency, citing fear of imminent attacks. Yameen lifted the state of emergency after just six days, following international pressure and cancellations at resorts. “Much has changed within the government now, and that is why this protest will be different, Yameen has admitted to missing weapons, and missing money. This protest is not just about freeing President Nasheed now, it is about saving the country. 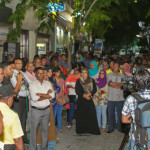 Given the change in circumstances, and the weakening of the state, we expect our protest will be a prolonged one, and we hope to see a lot of people there,” said MDP Vice President Mohamed Shifaz. MDP has gathered historic numbers at the May 1 and February 27 rallies, but has so far not been able to effect a change in the government’s stance. While former Vice President Ahmed Adeeb’s arrest has weakened Yameen’s government, the president appears to have consolidated power in the past two months, as both the parliament and judiciary have largely followed his agenda. With just a week left, the MDP has stepped up efforts to mobilize people, holding meetings with members from nine different atolls. 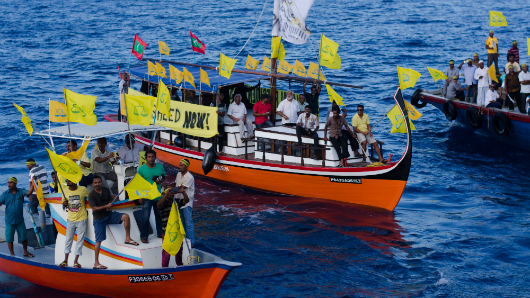 MDP has called on all of its members from the remote atolls to join the protest in Malé. MDP’s protest plans appears to have caused concern with the police, the human rights watchdog and the elections commission holding a meeting on Wednesday morning, specifically to discuss the rally. In a statement, the EC said the three bodies will hold a formal meeting with the MDP leadership. The statement threatened action against illegal activities. The commission had fined the MDP for the May 1 protest, during which clashes erupted with police officers and hundreds were arrested. The Human Rights Commission of the Maldives said it would closely monitor the situation and share information with the EC. The government insists it is up to the Supreme Court to release Nasheed, whose imprisonment a UN human rights panel found illegal. 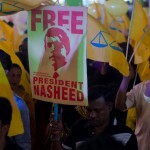 Nasheed’s imprisonment, which coincided with the jailing of former Defence Minister Mohamed Nazim, has drawn international criticism. The opposition leader’s international legal team is lobbying for targeted sanctions on government officials in the face of continued government defiance.